Recently, there have been a lot of questions about whether the Puplic Interest Litigation (P.I.L.) filed by the NGO Denjong Nang-ten Sung-kyob Tsogpa (D.N.S.T.) was instigated by the Karmapa Charitable Trust (K.C.T), His Holiness Karmapa’s administration or that of the Kunzig Shamar Rinpoche. I would like to clarify that there has been no involvement whatsoever from the Kunzig Shamar Rinpoche, His Holiness Karmapa or the Karmapa Charitable Trust. The D.N.S.T is a Sikkim based NGO who’s been working together with the central government of India with the interest of keeping Chinese influence out of the state of Sikkim. This group filed the P.I.L. to the Himachal Pradesh government to not allow the charges to be removed against Ugyen Thinley Dorje because they feel that his very presence in India and the attempts to be brought into Sikkim threaten the geopolitically sensitive region. The concern of the D.N.S.T. is that Ugyen Thinley has been officially recognized and enthroned by the Chinese government, the very government who has claimed in the past that the state of Sikkim is, in fact, a part of China and not India, much like the heated debates over Arunachal Pradesh between China and India. In any case, however complex the reasons were for the D.N.S.T.’s P.I.L. 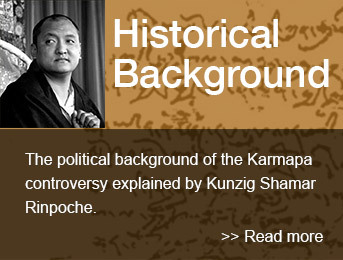 filed with the Himachal Pradesh government, there was no involvement from His Holiness Karmapa, the K.C.T or the Kunzig Shamar Rinpoche in this matter. Neither the Administration of His Holiness Karmapa nor that of the Kunzig Shamarpa have had any involvement with any police or government interaction with Ugyen Thinley, be it in the recent money scandal or any other governmental intervention. However, in the court case of the K.C.T over the stewardship of Rumtek monastery, there has been the use of large sums of money from the side of Ugyen Thinley to jeopardize the judicial process, such as disrupting the court appointed inventory of the monastery in 2003 by bribing influential lawyers and politicians. If such things continue to happen, the K.C.T. will of course challenge this and is keeping a watchful eye on the proceedings to make certain such illegal interferences do not take place. Nevertheless, it is important to make abundantly clear that His Holiness Karmapa, the Kunzig Shamar Rinpoche and the K.C.T. had no involvement whatsoever with the recent P.I.L. filed by the D.N.S.T. nor have they been involved with any aspect of the money scandal that has brought Ugyen Thinley and his administration notoriety in the media and in the eyes of the government of India.